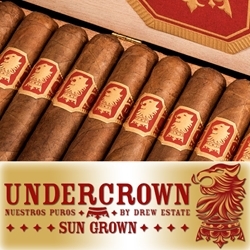 Undercrown Sun Grown is the third installment in the popular Undercrown series. Introduced in 2017, these hand-rolled premium cigars are said to be draped in wrappers grown in the open sun of Ecuador. They contain binders from a Connecticut River Valley stalk that are cut and cured, with a sun grown Habano leaf that complements a strong blend of prime Nicaraguan long-fillers. These premium cigars issue a well-balanced, full-bodied profile that is rich and spicy with a note of natural sweetness. There’s nothing like sitting back and enjoying a relaxing smoke on a beautiful sunny afternoon. Smokers Discounts can bring this moment to you when you pick up a box of these great Undercrown premium cigars. Try one of the varieties of sizes and flavors listed below. Each of these styles are available today for a discount price! Call us for more details!